Royal Doulton: dating from 1815, HRH’s collection features magnificent cut-glass-decanters and porcelain-ware including collectable plates and striking three-tier cake-stands. When it comes to collectible housewares, look no further. Wedgewood: Wedgewood is synonymous with British table-ware including fine bone China and embossed tea-sets, in addition to immaculate Waterford Crystal. 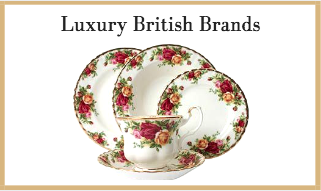 It’s a top UK luxury brand for a reason. Smythson: renowned Bond Street retailer of luxury stationery, diaries, notebooks & notecards. Their client list includes not only the current Royal Family but dates from Queen Victoria to the late Grace Kelly and more recently Madonna. The only place for personalised stationery for the well-heeled.